Well, here we are again, back in my home village of Penycae. At the top of the road in this picture is 1, Cristionydd, where we moved to in 1958. 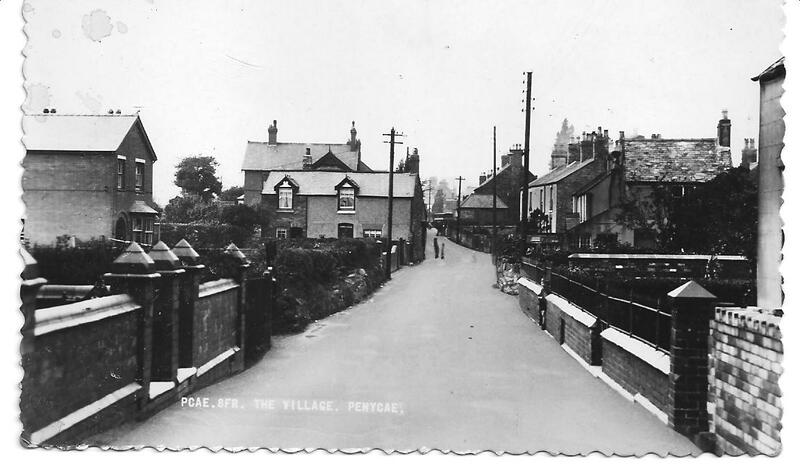 Hall Street, being the main road through the village played an important part in my upbringing because of who and what was alongside the road. Let's take a step back though to 1950. At the age of three I attended Penycae Infants School, and then the Junior School on the same site until I was aged eleven. My mother would later take a job as dinner lady at the school. There were three things that I particularly remember about being in the Infants School. One was the hours; 9.00am to 4.00pm five days a week. Secondly, because of the hours the school had camp beds, and we were put down to rest for an hour every day after lunch. Thirdly, we used individual slate boards and chalk in our early years before paper became the norm. Apart from the dust when the boards were wiped, how environmentally friendly this was. Slate abounded in North Wales, and it was not uncommon in rural areas in the early 1950's to use slate boards and chalk in schools. Anyone else have this memory? I have few other memories from school life in the Infant and Junior School, so it couldn't have been very conspicuous. I did not excite academically, so perhaps it was no surprise to fail the 11 plus. I do hope that in later years I have shown that you can be reasonably intelligent without being educated. 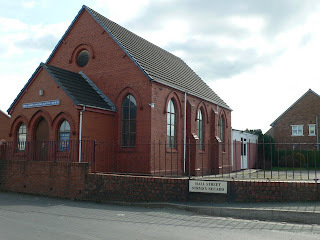 ﻿﻿﻿Zion English Baptist Chapel, Hall Street, Penycae was one of the most influential places in the first 21 years of my life. I should say that this photograph is Copyright Eirian Evans and licenced for reuse under the Creative Commons Licence. The building to the right of the Chapel was our home at 1, Cristionydd, so there wasn't far to go. Wales was a land of religious revivals, the last one being led by Evan Roberts in 1904. The result of this revival was that swathes of people attended Chapel, and new places of worship had to be built to accommodate them. Numerous 1000 - 1500 seater Chapels were built, and though the 1904 revival only lasted about a year, the effects of it lasted much longer. Fifty years later, and the majority of these buildings were virtually empty. In my late teens, when I started to travel around the area preaching, I would speak at a number of 1200 seater non-conformist Chapels, with upwards of 20 in attendance if I was lucky. The speaker always had to use the pulpit (there was no negotiation over this) and the few in the congregation would sit near the back of the Chapel. They'd always sat there you see. But that was when the Chapel was virtually full, so we were stuck. They wouldn't move nearer the front of the Chapel, and I wasn't allowed to move nearer the back. The plus side of all of this though was that I learnt all about voice projection in a very practical way. My baptism in the art of voice projection came at the age of five. Sunday Schools have always played an important part in the life particularly of non-conformist Chapels. In the 18th and early 19th Centuries they were places where children learnt to read and write. In many villages like my own, even the most 'ungodly' of parents would insist on their children having a Sunday School education. This meant large numbers attending Zion Chapel. The event of the year was the Annual Sunday School Anniversary. This was the one day that you could guarantee a packed house, and people who would never darken the doors of the Chapel at any other time would be there. The front of the Chapel would have decked seats as in the photograph, and all of the children would be crammed together. I was five, and this was my first Anniversary at Zion (previously I'd been taken to the Welsh Methodist Chapel Sunday School for a couple of years - I have no idea why as Welsh was not spoken at home). At Zion, you were encouraged to memorise something rather than read it from a page; this was to encourage you not to mumble. The instructions given to me that day remain as clear now, as when they were given nearly 60 years ago. Remember, I was sitting on a bank of seats, facing a packed Chapel of 200 - 300 people. I had memorised a short poem; there was no public address system; how to be heard. Then comes a kindly voice whispering in my ear. "John, do you see the top corner of the Chapel in front of you? Imagine there's a spider in that corner. He wants to hear what you are going to say. Lift your head up; look at that corner, and speak out as if the spider is the only thing in the room". I spoke to the imagined spider for upwards of another 15 years whilst I learnt the art of public speaking. Zion Chapel was a place of great encouragement. Almost every man was adept at public speaking to a greater or lesser degree. We attended as a family, and we always sat in the pew, second row from the back on the left. But then everyone else sat in their same seat, week in and week out. This was something that drove me bonkers in later years. When the time was right, the Chapel encouraged me to become a Sunday School teacher, and helped me to get the best out of it. It was another lesson on how to communicate, and little did I know at the time how influential this was going to be in my future career. On Remembrance Sunday, as with other Cities, Towns and Villages, we had a service at the Cenotaph. Every Church and group in the village would take part. I was somehow chosen to represent Zion on many occasions. Now I was getting experience of projecting my voice in the open air. Have you ever heard an older Welsh evangelical preacher in full flight? Sunday after Sunday we used to have them as guest speakers. I can still see and hear two or three of them, parading up and down the large stage area, arms like windmills, voice like thunder. A popular theme was Hell. Some of the speakers sought to frighten you into the kingdom of God, by getting you to picture the eternal flames of Hell. On occasions you felt that you had to hold on to the pew for dear life, or you would slip into Hell. It was not what you would call heart warming. Powerful, but not what you would call uplifting. Zion asked me to preach my first sermon when I was aged 15. I had been on a ten year learning curve. After years of Hell, I decided to speak on the love of God. I stole the sermon from Thomas Brooks, a 17th Century Puritan speaker. If it was good enough for him it was good enough for me. Over the next 8 years I would speak many times in Zion, and in other Chapels all around the area. In 1970 I went to Theological College in Belfast, and after three years training, spent the following twelve years looking after Churches, with some success. However, for personal reasons, this has not been part of my life for the last 20 years, and organised religion of any sort will continue to have no interest for me. In spite of that, I will be ever grateful to Zion Chapel, for the opportunities and encouragement they gave me to develop skills as a public speaker. Today's training courses could learn much from the simple approach shown to me. On the corner of Hall Street and Cristionydd, opposite Zion Chapel, still stands today the Black Horse Pub. There were originally 10 pubs in the village, but I think it's now down to two. The Black Horse pub could be seen from our house, and on the pavement where the roads meet was to be found a seat. Young people gathered at the seat at all times of the day and night, but at closing time on a Saturday, it belonged to men coming out of the pub. I would have been in bed as a youngster, but would be awakened around 11.00 - 11.30pm by the sound of singing. Most of the men would have been miners, and belonged to one choir or another. Quite frankly they were pissed. Every Saturday night. But if I close my eyes, I can believe that I'm listening to that group of men sitting on the seat singing the most beautiful of melodies. Drink did not affect the harmony or the timing. For an hour every Saturday night, I felt that I was present in the finest concert hall. Now you don't get that experience everywhere. I'd hoped to finish my sojourn today, but I've rabbited on a bit, so there will be one more journey to My Village, My Home. Love your 'rabbiting' John - we are all a sum of our past, our prejudices, our ambitions, our beliefs and our dreams. I discovered that when last year I wrote what I laughingly refer to as my 'memoirs'. It was good to get the rabbiting out of my system and to explore what I believed in and why. It is also so good to hear of other peoples' journey through the world - it helps to explain our own and put it into context.